This is the perfect sampler if you want to try a little of all APR has to offer... for only $25 INCLUDING shipping!!! Both of our brand new APR Body Franklin soaps - the glycerin & triple butter. While not a president (unless you count his term as President of Pennsylvania) Franklin's contributions to America are priceless: “The First American” was an inventor, author, ambassador, statesman and scientist. 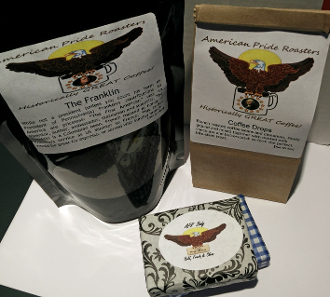 The Franklin is a Colombian bean, French roasted in honor of Franklin's service as US Minister to France. This coffee would be great for espresso, or served with Sunday brunch. French roasted coffee beans and cinnamon, finely ground and mixed together with melted milk chocolate and butterscotch to form the perfect bite-sized treat. Our APR Body Coffee Soaps are free from harmful ingredients and chemical fragrances. Each Glycerin bar is free of all detergents. Each three butter bar includes the moisturizing properties of Shea butter, cocoa butter, and mango butter. This soap has a creamy lather with 100% of the lather coming from the saponification of natural oils. APR’s Franklin blend coffee is ground extra fine and added to the soap providing the benefits of reducing redness and inflammation, exfoliates, tightens, and brightens the skin, reduces eye puffiness, shines, enhances the color, and stimulates hair growth. You also get that bold APR coffee aroma - a fresh and clean start to your day!